Though almost everybody likes listening to the music while driving the car, they think the installation is complicated. So, they leave it to the professionals. If you are a novice and want to install as well as connect the speakers to the amplifiers by yourself, you are in the right place. You'll learn the ins and outs of wiring car speakers or Subwoofer to the speakers with understandable diagrams. So, no confusion will be left, and also it requires no technical knowledge. By the way, you’ll also learn some basics of the tools related to the car speakers which will help you later. So, now follow the steps below for manual installation of car speakers to the amp. It is the very first step for every car audio installation, indeed, every automotive audio installation. So, at first, disconnect the negative wire from the battery cable. It helps you to avoid sudden short circuit. The latest model has a simple negative wire, and you can remove it without any tools. But, you may need a "radio code" to reactivate the radio for some models. When you want to install the system, the placing is the foremost important factor. You must mount the amplifiers and car speakers at least three feet away from the metal chassis to prevent annoying static, buzzing or humming. So, you may attach the car speakers to the back of the subwoofer box, underneath the driver, underneath the trunk near the spare or behind the dashboard. Here, it is no matter where you place; you must mount it in a tight place. After deciding the place, you need an amplifier wiring kit which fits your size. The kit must have exact gauge wires with a fuse holder to protect your amplifier from being damaged. Here is a cation. Don't use pliers to crimp the connectors. Instead of the pliers, you can use a crimping tool which creates no trouble with the connectors. In fact, a crimping tool is much more worthy of than the fliers. Now, connect the positive wire to the engine bay from inside the car. Then fit the wire to a rubber hole inside the car. The cars come with some rubber holes to be fed the positive wire. However, you may drill a hole unless you find the kit holes. Remember, it is the final stage to drill the car for attaching the wire. After feeding the positive wire into the engine bay, now attach it to the fuse box. The other end of the positive wire is to be crimped. Now, connect the crimped end to the battery. Caution: Don’t try to attach the negative wire to the battery. It’ll destruct your whole system. As every audio system has some basics, you have to follow the basic rules of connection. So, follow the previous step to connect the positive wire to the battery along with a fuse holder. Then, attach the negative wire to the car frame by pulling trim to find a good bolt. You can cover the wire with wax or sand down the area to get good contact. However, you can also use a splice connector to connect the remote wire. Moreover, it is the best way to use a switch to control the power of the amplifier. Otherwise, it’ll drain your battery. Now, complete the wiring of the speakers. You may use a single or multiple speakers depending or series or parallel connection. However, the amount of resistance depends on the way you use to connect the speakers. An important thing you should not forget to use a capacitor to attach the battery and the amplifier. The capacitor helps to control the flow of the electricity to the speakers from the amplifier. Moreover, you may need an RCA cable to connect the aftermarket radio to the amplifier. Also, it helps to attach the existing indoor speakers to connect to the radio. Now, hiding the wire is the most critical and flush task for car audio installation. Here, people make mistakes a lot. So, invest on a door panel remover which helps you too remove as much trim as possible, lift the carpet and the removable seats. You may also need to remove the dashboard so that you can work comfortably. Then, run the power cables and the RCA on opposite sides of the car. It helps to prevent sound hum and distortion. Moreover, run the RCA cables under the carpet to the speakers. If you run it on the carpet, you may fall by binding on the wires. At last, cover the cables with plastic wrap to hide it from the view. Once you connect the amplifier to the speakers, it’s time to test whether it runs or not. So, connect the amplifier output jack to each of the speakers and play music. Here, the speaker wires should be 16-gauge as well as 14-gauge or 12-gauge will be perfect for the subwoofers. Now, connect the negative end of the wires to the speakers as positive to the battery terminals. The sound quality depends on the proper connection. When each connection is checked well, re-install the connection to restore the power. If all the settings are alright, the car radio will play the music. Music delights your ears as it makes your driving cozy. So, a distortion may destroy your mood while driving. Also, the sound quality wholly depends on how the car audio is wiring. 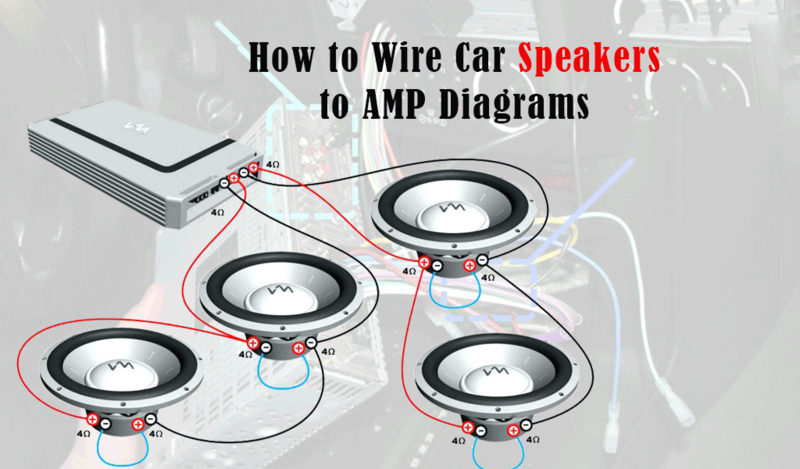 Wiring the car speakers to the amplifier is simple. So, try it yourself and make your listening fun. How to Wire a Subwoofer to a Home Stereo?